Defunct Audio Manufacturers - Be to Bh - audiotools.com. Please send any factual corrections, dead links, information and/or links that you feel that should be on this page to the page maintainer or if you have a question that might interest others such as about a specific equipment or brands, leave a message on the Facebook page. A small manufacturer of cinema projectors originally founded in 1953 by Henry Michael Rahmer but he bought the designs and tooling of a bankrupt projector manufacturer that had been known as Danson and set up shop in Witham in Essex. England with the financial and operational support of Philip Hounsfield. BE's original factory was in fact a small corner of Hounsfield's Parion Products concern that at the time made caravans and related accessories. The company branched into the manufacture of 2 models of low budget power amplifiers based on Mullard circuits plans in 1954, these where branded Beam Echo and supplied to OEM accounts rather than to end users, but they where enough of a success to encourage Mr. Rahmer into hiring Gordon R. Lawson of Lawson & Parsons to design a new line of mid/high end valve hi-fi amplifiers that where introduced into the market under the new Avantic brandname in 1956. While the Avantic amplifiers where still based around Mullard circuits they where more refined than most such sold at the time, but in the 50's the majority of audio amplifiers sold in the UK where based directly or indirectly on technical publications issued by Dutch manufacturer Philips that where intended as a sales aid for the thermionic valves they produced, Philips invariably sold them under local names in local markets and in the UK the valve manufacturing arm of Philips was named Mullard. While those plans were good they where rather generic and this meant that most British amplifiers sold at the time sounded the same and where bought on price alone. The more refined Avantic amplifiers appeared at a time when interest in Hi-fi was booming and gained quite an interest from both the Hi-fi press and from enthusiast which lead to healthy sales which in turn spurred Beam Echo to quickly follow them up with loudspeakers, a tape recorder, tuners and other audio gear. The company did however have some problems with distribution since dealers already carrying the more established brands where somewhat reluctant to carry BM's products and this led the company to establish a presence in NA, and while it never gained any significant exposure over there the significantly larger market and higher disposable income of the average punter meant half or more of their sales where exported to North America which was unusual at the time with BSR being the only other UK company with any sizeable export sales until the latter half of the 60's. There was always a slight air of pretentiousness surrounding the Beam Echo company, early models of their products where marked as being made in Witham but later products are marked for cosmetical reasons as "made in London" and Mr. Rahmer who was something of a colourful character, insisted on being called André Rahmer, allegedly this was due to him thinking that Henry Michael was rather too common a name for a company director, but there are some indications that he had earlier used a couple of other names, which gives a slightly different slant to it. The company continued to do rather well during the early 60's although it did not grow a lot and Mr. Rahmer sold it to Thorn-EMI in 1962 or 63 and they closed the Witham factory down in 1965 and discontinued the use of most of the BM designs and trademarks soon thereafter. We have some minor information on Beam Echo Amplifiers. Small manufacturer of valve amplifiers based in Christchurch, Dorset, England. Founded by designer Stuart Perry sometime in the early 1990's and shipped it's first model in 1995 which was basically a modernised clone of the Beam Echo DL7-35, the name and the basic designs of the new Beam Echo company where taken from the Beam-Echo Ltd. company (above) but there was no actual connection between the 2, which makes the proclamation "established 1953" that was found in the company's adverts and on their webpage seem somewhat odd, Mr. Perry also never used the Avantic brandname since Thorn-EMI could lay claim to that. In fact this attempt to link together the history of the 2 companies gave the venture a hint of pretentiousness not helped by the "London - Tokyo - Paris - Rome" slogan, B-E Ltd. was after all being operated from an industrial estate in Dorset, which is not the most glamorous of locations. The company added a number of models to the lineup in the latter half of the 90's and in 2001 or thereabouts BM announced a commemorative of amplifier series called the "301 Vinyl Celebration series" although it was not clear what the company was commemorating, in a similar time frame Mr. Perry announced that he was selling his collection of vintage English valve audio equipment. The company homepage disappeared in late 2005 and attempts to contact the company by other means have proved fruitless, in addition PCB's from the company appeared for sale in sundry places in 2006 so it is safe to assume that it is no longer with us. We have been told that Stuart Perry is the same person as reported on Internet audio for HFN&RR in the latter half of the 90's but I have not been able to verify that. More info on the company's products can be had : Beam Echo Amplifiers. Swiss maker of pickups and related products, originally founded by aeronautical engineer Ernst Benz-Schmidt to make diamonds for mechanical watch movements in the late 60's and then named Benz Mikrodiamanten and was stationed in Neuhausen Am Rheinfall in Schaffhausen canton but in 1977 incorporated as Benz Micro and then based in Winterthur in Zurich canton. When the market for clockwork diamonds and ruby's started contracting in the 70's he steered the company towards the manufacture of diamonds for the phonographic industry and when that market in turn started to contract in the 1980's he bought the intellectual and cartridge manufacturing assets of the Empire Scientific company and started manufacturing improved versions of the classic Empire MI designs in Switzerland under the Empire brand, in addition to making a number of phonographic related accessories. Hr. Benz also teamed up with Aalt Jouk van den Hul, the latter designing a moving coil pickup called the DDT that was made by BM but was sold under the Van Den Hul name, this model was housed in a metal case similar to the Empire casings, while later a variant of that design with a wooden housing was sold under the Benz Micro moniker. Both of these pickups generated a lot of interest in the Hi-fi press and in particular the Benz Micro variant and sold well, after that the Empire designs and name where gradually phased out in preference to MC designs developed from the original VdH design, the company also started manufacturing aeronautical chronometers which also generated interest, being at the time somewhat unique and just one third of the price of the mechanical clocks usually seen in such Grob Aerospace. Sadly Hr. Benz was caught up in a traffic accident and while he was recovering the fortunes of his company waned without him at the helm and in the end BM went into bankruptcy proceedings in 1997 and was dissolved in October of that year. However Albert Lukaschek who was Hr. Benz right hand man purchased the rights to the company's IP and the tooling and restated production almost immediately under the name of Lukaschek HiFi-Elektronik (but trades as Benz Micro Switzerland), and has continued to manufacture and improve on the BM designs. For a time there where cheap clones sold in the USA of the clockworks that BM had made that where blatantly enough sold using the BMS logo, but Hr. Benz moved to the USA and managed to secure the trademark rights to the Benz name (on timepieces and avionic products anyway, I doubt they will allow him into the car market) and soon thereafter set up a company that manufactures mechanical watches under the Ernst Benz name, the new company did for a time produce and mechanical aviation clockworks like the old Benz Micro company did but drooped that from their catalogue in the latter half of the 00's due to lack of demand. And is by all accounts doing rather well, at the least well enough so that clones of his products are sold under the Ben brand. Run by Richard Berger and based in La Mirada, California, USA. Prior to their purchase of the assets of the Craig company in 1985 the company operated mostly as a local distributor, subsequent to that the company used the Craig name to brand a variety of cheap Asian CE imports and market them in the USA, much like the original company had done in the last years of its life. Changed its name to Berel Industries in 1989 and changed it's name again in 1997 to Craig Consumer Electronics but filed for bankruptcy on Aug. 1 the same year. Following an investigation by the Securities and Exchange Commission into financial irregularities Mr. Berger was forced to pay a $25,000 fine and was barred from serving as a corporate officer for five years afterwards, in 2000 Mr. Berger and 2 other former Bercor executives were charged on no less than 34 separate counts of fraud and related activities in relation to the bankruptcy. The Craig brandname was sold by the bankruptcy court to New Tech Industries. Berkley Integrated Audio Software Inc.
Company that made audio editing and processing software that was better known under its initials or BIAS and was originally based in Sausalito, California USA but by 1998 had a home in Petaluma in the same state. Originally founded in 1996 by the husband and wife team of Stephen W. and Christine A. Berkley but the former had been trading for a couple of years prior using the BIAS name. Their first and best known product from the company was a sample editor that was fairly quickly developed into a two channel audio recorder called Peak that was exclusively developed for MacOs and was for a while wildly popular as it was at the time the best audio editing program for the Mac platform that did not require the purchase of specific hardware, a cut-down version called Peak LE was made available in 1996 that was primarily not sold to consumers but rather licensed to hardware manufacturers to ship with their hardware, that variant was also popular, you were hardly able to purchase a CD recorder or a soundcard for the Mac in the late 90's without getting a copy of Peak LE with it. Peak was fairly quickly followed by with a plugin suite called SFX Machine in early 1997, note that this was not a plugin in the modern sense but rather a suite of effects and sound generators that worked with Peak only although they later offered a version that worked with the Adobe Premire video editing suite, the SFX Machine was nota bene not developed in-house by BIAS but rather done by Earl Vickers who is today selling updated VST etc., versions of this program through his company The Sound Guy. In 1998 the company bought the Deck multitrack hard disk recording software package from Macromedia but the latter company had acquired it only a couple of years earlier by purchasing Obscure Software (OSC) but the original development team had left Macromedia after a share value disagreement leaving the company appearing to lose interest in the recording market and deciding to concentrate on the content creation side of the business. 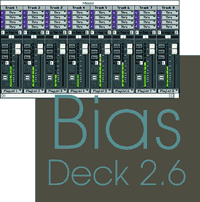 BIAS decided to take advantage of the situation and purchase Deck and initially it sold reasonably well but it had lost momentum and appeared somewhat behind the times versus products such as Steinberg's Cubase that integrated multitrack audio recording with sequencing capabilities, in the end the last version of the software was 3.5.1 that was released in 2002 and there never was a MacOSX version of Deck released. Up until 1999 the company had only shipped products for the Mac but that year the company announced that a version of Peak was under development for BeOs and the year after they announced that there would be a version of Deck for that OS as well but it appears that BIAS never actually shipped any BeOs products. In 2001 the company however announced VBOX a cross platform MacOSX/MS Windows signal processing software host that could operate both as a standalone application and as a VST plugin integrator that allowed you to chain and mix VST effect in applications that did not allow such functionality or those that offered such in only a limited fashion. Later the same year the company also announced a new EQ plugin called Superfreq but only in a MacOSX version but apart from Peak itself, all new software releases after Superfreq were for both Mac and PC. The company started shipping Soundsoap in 2003 but that is a noise reduction plugin intended to tackle both consumer and pro audio applications, it can be run either as a VST plugin or as a standalone program, BIAS shipped a few upgrades during the next couple of years but no new products until early 2006 when they introduced the Master Perfections Suite but that was a bundle of mastering plugins that had originally been developed for a special mastering version of Peak but the company then decided to offer seperatly, the bundle included EQ, auto-tuner, multiband compressor, limiter, spectral EQ & matching plugin, Superfreq and a gate/downward expander plugin. There was fairly little action seen from the company during the latter half of the first decade, Peak was upgraded to version 6 in late 2008 and in 2009 the company un-bundled the Master Production suite and offered the individual plugins from that suite for purchase singly in upgraded versions, they also shipped a simple iPhone recording application called iProRecorder later that same year and in 2011 introduced a more consumer friendly version of Soundsoap called SoundSaver. BIAS started shedding parts of their software development team in 2011/2012 and closed its doors in June 2012 with Mr Berkley in an letter published on a number of discussion sites blaming a rouge developer for much of the company's problems. The Berkley's had assigned the rights to the software products to a separate holdings company called Marin Audio Technology in 2009, it is not known if there is an intension to re-license to another company or to form a new one but BIAS was promising a multitrack capable version of Peak as late as couple of weeks before they closed so apparently there was some development going on to the end. When this was written the authorisation servers for all fairly modern BIAS products were still up, the website was also still open but it only had the update downloads and the FAQ area still working with all other content having been removed. Australian manufacturer based in Templestowe, Victoria that manufactured high end hi-fi products under the Symfonia brand. Founded by communication engineer Stanley Berkley and hi-fi salesman Vincent Testa in 1992 to manufacture the Opus 10 power amplifier designed by Berkley but soon thereafter introduced more amplifiers and other products such as power supplies and crossovers, branched into AV with the introduction of a 6 channel high power amp in the late 90's and announced a new high tech class D PWM amplifier at the same time based around technology developed at the University of Melbourne. Disappeared in late 2001 and we have not been able to find out any more since then, except that Vince Testa is now apparently a beekeeper in his native Templestowe and indeed functions as the president of the local Beekeepers club! For background information read this interview. USA based hi-fi and audio company run by Bert Berlant and based in Los Angeles, California. Originally the trade name was Berlant, later Berlant-Concertone and finally just Concertone, primarily known for their open reel recorders and of those early designs were by Berlant himself and manufactured in the USA but later recorders from this company were rebadged TEAC products, company fizzled out in late 60's early 70's. Not to be confused with the French amplifier manufacturer named Concertone active in a similar/slightly later time frame. French gentleman that manufactured a range of high end full-range loudspeaker drive units, interconnects and cables under the PHY-HP brand. Mr Salabert ran a hi-fi store in his native Montpellier, the in the Languedoc-Roussillon province during the 1970's and 80's that amongst other things sold high bandwidth full range drivers made by Supravox and University to the DIY community. When Telex, the then owner of the University brand decided to stop making derivatives of the old wideband drivers and then manufacturer of the Supravox designs decided to retire in 1993 it left the connoisseurs of the tuned open cabinet style of loudspeakers without a suitable product to plug into their cabinets. Mr Salabert knew the Mr Ghio both as a customer and he had also take a training course in the company a couple of years earlier and he tried to buy the company but was outbid by a competitor, however the new Supravox company only lasted until 1995 and that lead Mr Salabert to take matters into his own hands and start the manufacture of drivers himself, and shipped his first products in 1996. Sadly he passed away in 2011 and the operation was bought by Samuel Furon who in 2012 integrated it into a new operation called Laboratoire d'Acoustique et d'Electronique. © 1993 - 2013 Ólafur Gunnlaugsson, all rights reserved.